T-Mobile (TMUS) Chief Executive John Legere, whose aggressive and effective marketing has stunned the wireless industry, has managed to capture headlines at Consumer Electronics Show in Las Vegas, the tech industry's carefully orchestrated public relations event. But the headlines aren't about technology. For reasons best understood by him, Legere decided to crash a party hosted by T-Mobile's arch-enemy AT&T (T) because, at least according to media reports, he is a fan of the rapper Macklemore, who was scheduled to perform there. Legere, though, never got to see the Grammy award-winning performer best known for his hit "Thrift Shop." According to a widely cited account by CNET reporter Roger Cheng, Legere was escorted out of the party by AT&T security. The executive told re/code that he was told by "these gigantic goons" that he would be charged with trespassing if he didn't leave immediately. He took their advice. Judging by the reaction on Legere's Twitter feed, getting thrown out of AT&T’s party seems have burnished his image among some customers, which as the U.S. wireless market continues to mature, are getting tougher for carriers to attract. 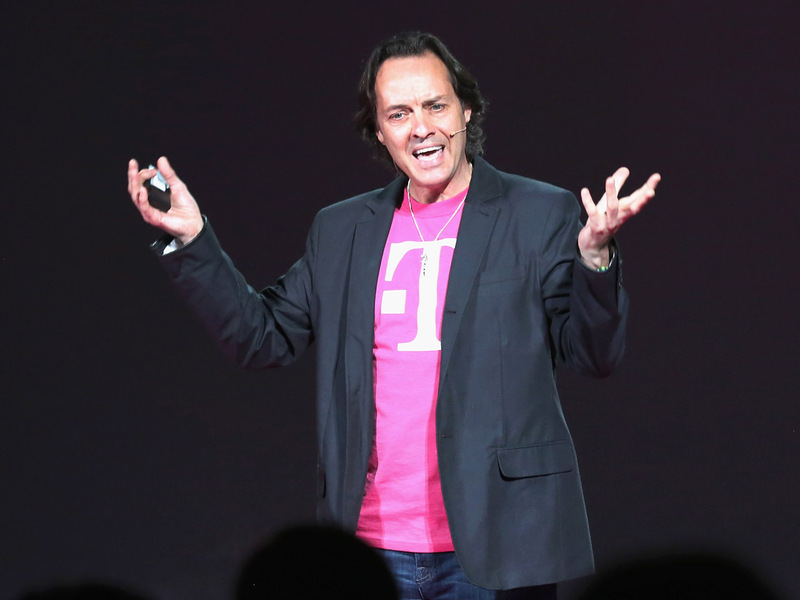 Though this may seem frivolous, the Legere kerfuffle highlights the growing tension between AT&T, the number two wireless provider, and fourth place T-Mobile. AT&T recently announced that T-Mobile customers could get credits worth as much as $450 for switching their service. AT&T denies that its promotion was anything unusual. However, at last year's CES, Legere called AT&T's network "crap" and he rarely misses a chance to take a shot at the Dallas-based company. "Since taking over as CEO in 2012, Legere has been undercutting larger competitors with cheaper plans, quicker upgrade privileges and free international roaming," according to Bloomberg News. AT&T was forced to drop its $39 billion acquisition of T-Mobile in 2011 because of opposition from antitrust regulators. There have been numerous media reports that Japan's SoftBank is planning to bid for T-Mobile, the U.S. arm of Germany's Deutsche Telekom, and merge it with Sprint, which it gained control of last year. Some analysts are skeptical that antitrust regulators would approve such a transaction. Customers, too, may wonder whether T-Mobile's unique corporate culture that Legere has created would survive if it were acquired by a larger player. Though Legere clearly enjoys his reputation as a maverick, he may not be able to resist Wall Street's pressure to grow either by partnering with Sprint or another larger player. T-Mobile earned $52.20 in average revenue per user (ARPU), a favorite metric of Wall Street, during the last quarter, far worse than top ranked Verizon Wireless’ $112.86 and AT&T’s $65.20. As competition intensifies, analysts are expecting carriers to launch even more aggressive promotions because the only way they can grow is to take each other's customers.